A minimalist look and clean lines characterize modern design, while contemporary design focuses on what’s currently on trend. If you are a fan of one or both, get ready to be blown away! 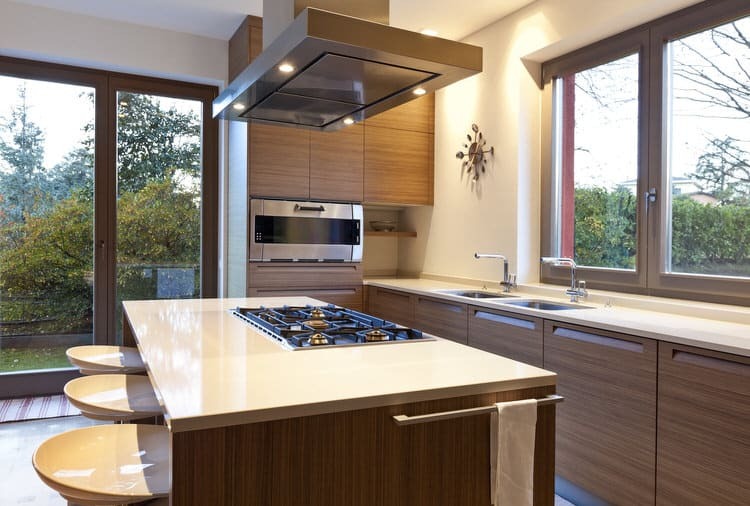 These kitchens represent the best of modernism and contemporary design—incorporating the latest trends, colors, surfacing materials, furniture and appliances. Some of these kitchens are so fresh, they could be considered downright futuristic. 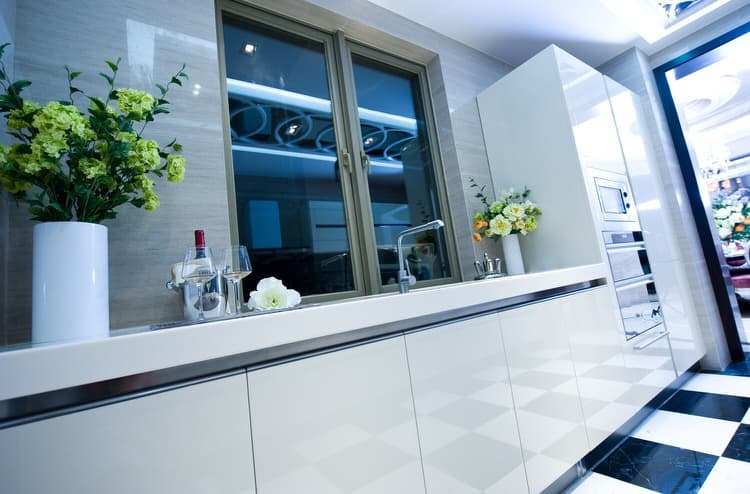 Here’s a fabulous way to highlight your kitchen’s modern design—by creating a reflective glass backsplash. Begin by painting the wall the color of your choice (for us it was white). Contact a reputable glass company and let them take measurements, cut and install the glass (definitely not a DIY project). A glass backsplash makes for easy cleanup and gives your kitchen a sleek, custom look. 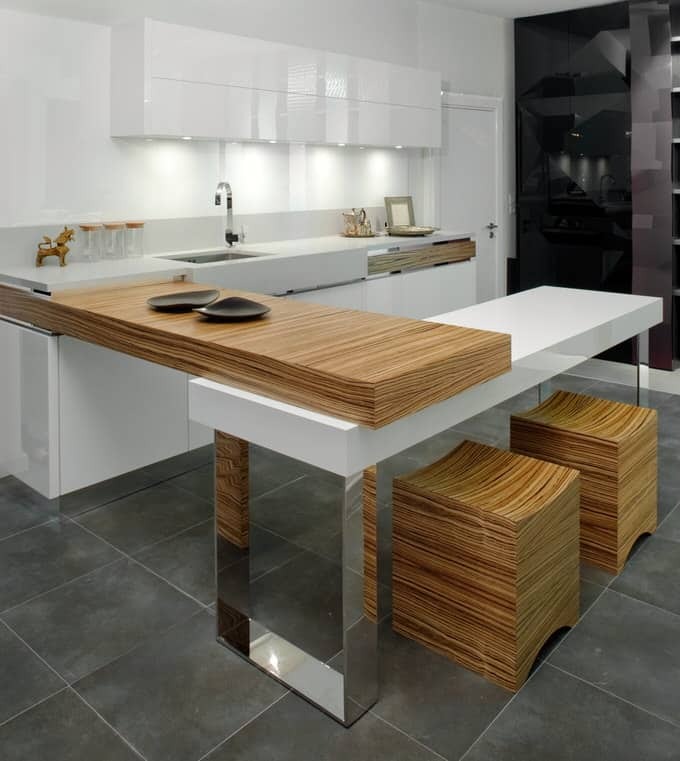 The type of kitchen seating you choose can either make or break your contemporary kitchen design. The owners of this kitchen got it right. The minimal room has straight, angular lines, so they decided to add some curves to the mix. These molded scoop seat counter stools pick up the color of the counter and give the room a soft element to offset the hard lines. 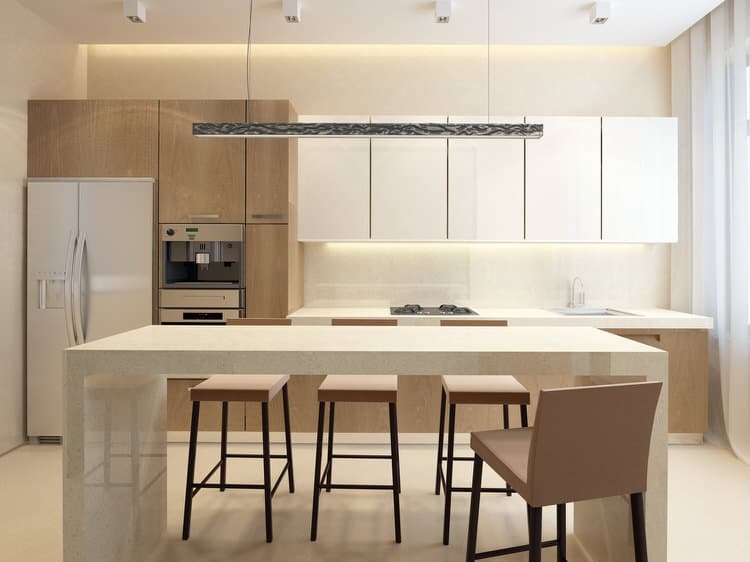 This contemporary kitchen plays off of a variety of textures and neutrals to create a warm, lived in look. The graphic pattern of the black-and-white area rug works well with the white and light wood tones of the cabinetry and island. The stacked stone veneer wall is a textural match for the rustic wood flooring. Clear globe pendants on dimmers provide subtle accent light for romantic evenings. This modern kitchen takes full advantage of the great outdoors. The narrow configuration of the home and floor to ceiling glass doors leading to the pool area, make this kitchen a real indoor-outdoor entertaining space. The kitchen’s color palette picks up the hues from the patio and landscape, completing the merging of two areas into one. 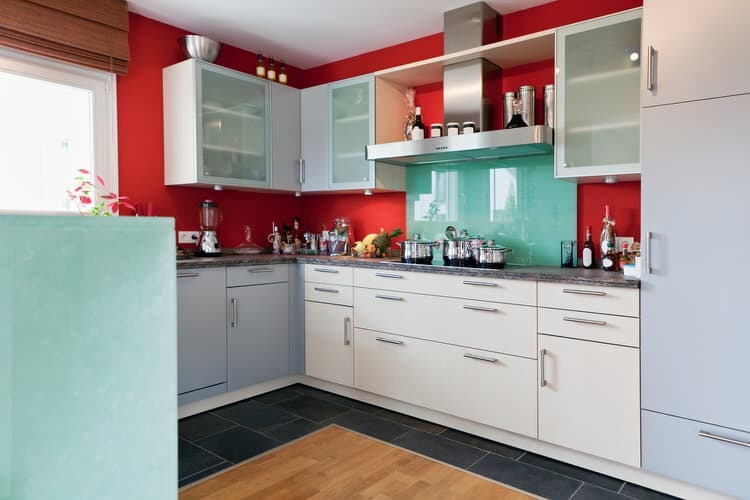 Modern kitchens invite bold elements into the design by way of bright color. 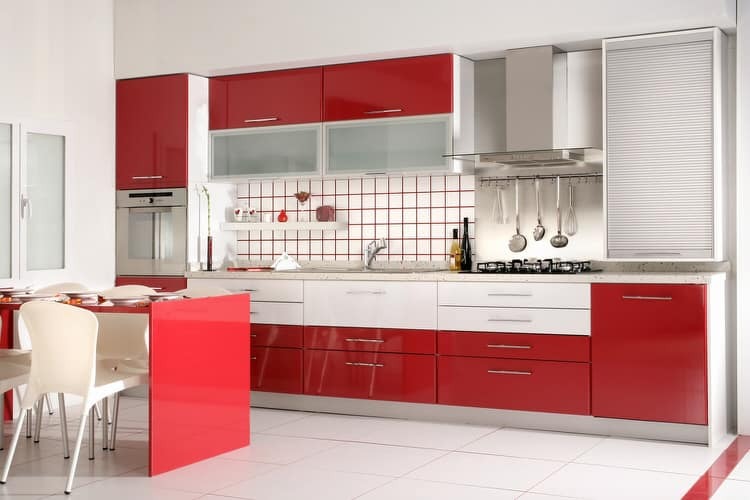 The fire engine red of the cabinets creates a big design impact in an already daring kitchen. The designer/owner is fearless when it comes to color and we think it totally works in this space. Millennials are embracing 20th design and using it throughout their homes. When one couple purchased their 1973 ranch, they moved the kitchen from its original location to the den. Why? Because of the big stone feature wall and floor to ceiling windows, of course. 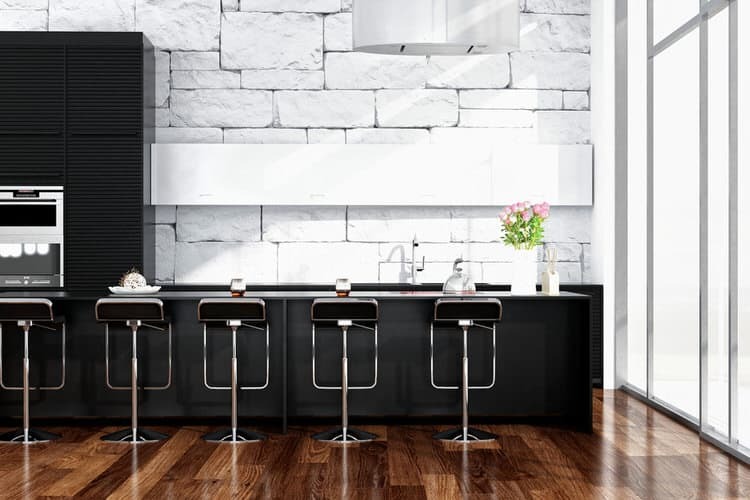 They painted the wall bright white and added black cabinetry to create instant kitchen drama. 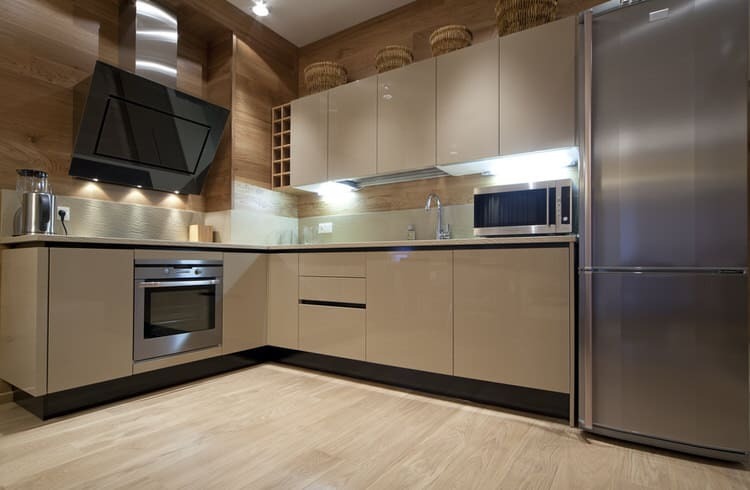 Sometimes hard surfaces in a small, modern kitchen can overwhelm. 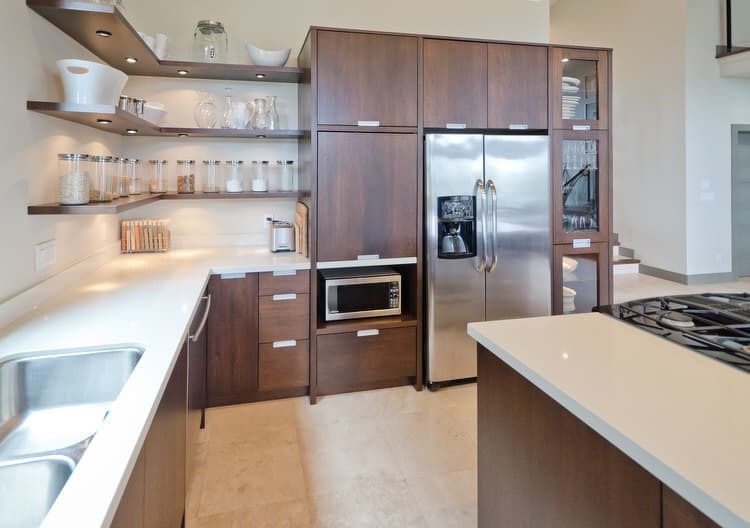 Use light wood finishes and cabinetry to brighten the mood. 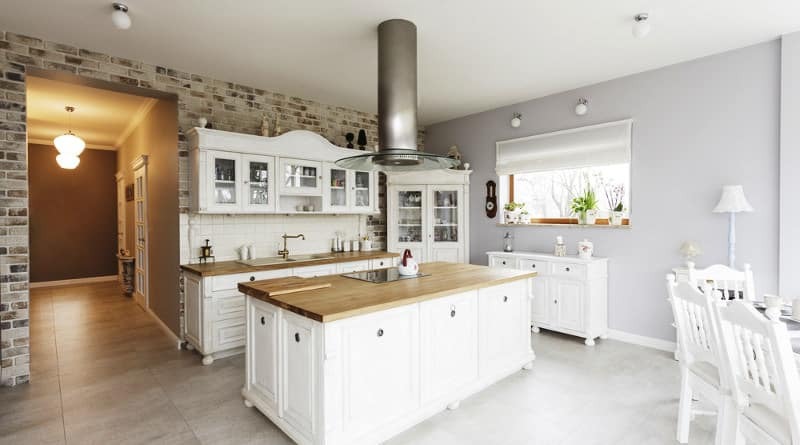 Using a cream-colored laminate on the cabinets and unstained birch flooring help to soften the look. Just imagine how heavy the room would feel if all the hard surfaces were cloaked in dark colors. Steel blue elevated this tiny apartment kitchen from ho-hum to modern marvel. The owners were on a tight budget so they kept the existing appliances, hardware and countertops. They hated the outdated stain on the cabinets and island. 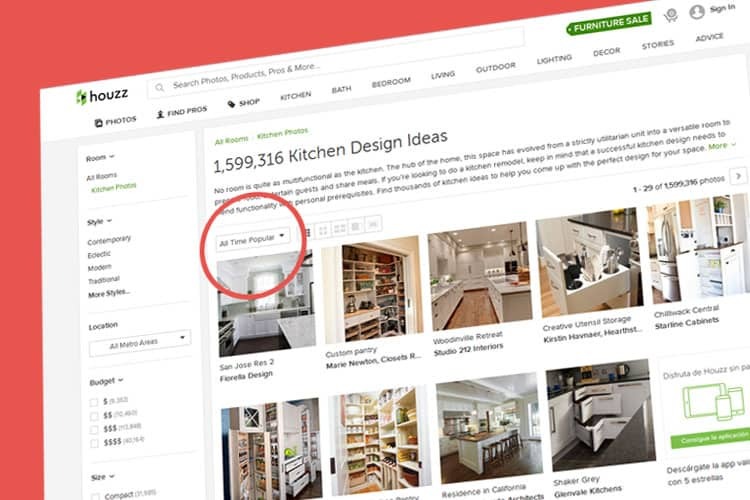 They got the advice of a professional contractor on technique and products to use. Over the course of one weekend they completely transformed the space with color. Can a modern kitchen have too much color? Never, says the designer of this appetizing space. She incorporated the color red in almost every aspect of the kitchen—from the tile grout on the backsplash to the custom eat-in dinette table. 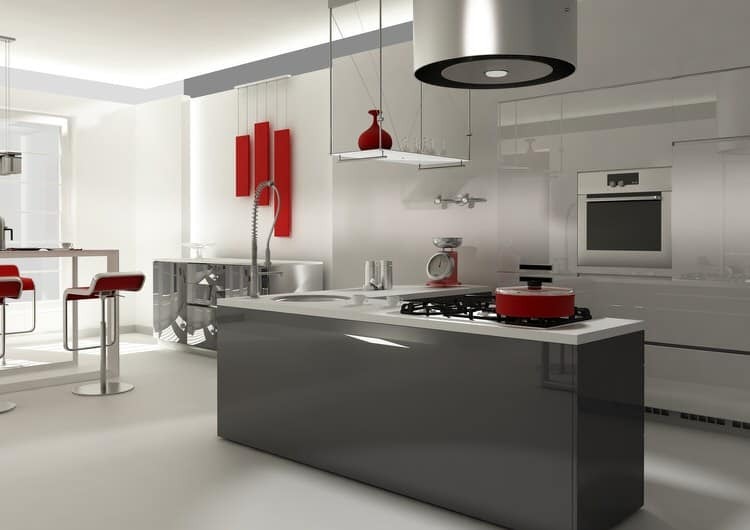 In her opinion, red is the perfect companion to white and stainless. We heartily concur. 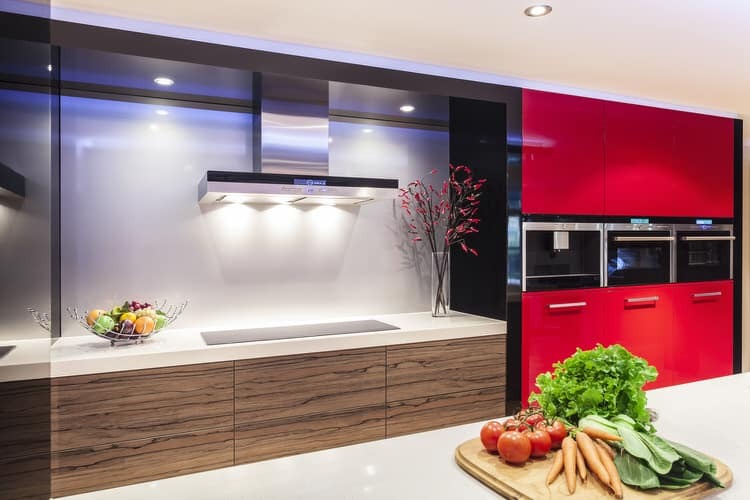 Clean lines, crisp angles and a jolt of bold color give this kitchen a decidedly modern appearance. To recreate this sharp, chic style, choose cabinets and appliances with sleek surfaces and angular lines. Go with accents like ultra-modern light fixtures and seating to emphasize the look. Neutral grays and warm wood tones dominate this contemporary loft kitchen. The light gray paint color, soapstone counters and taupe TV wall would be extremely boring without an inviting color and texture. The stunning pecan cabinetry, seating and raised breakfast counter are the perfect way to thaw out the cool grays. A sleek, black counter and modern touches galore make this one unconventional mountain retreat. In an area dotted with Swiss chalets and rustic cabins, this modern home is quite the rarity. The kitchen is the star of the show and with its unobstructed views to the majestic scenery beyond. All of the work areas are cleverly tucked off to the side or situated below the island counter. Not all modern kitchens are boring and sterile. 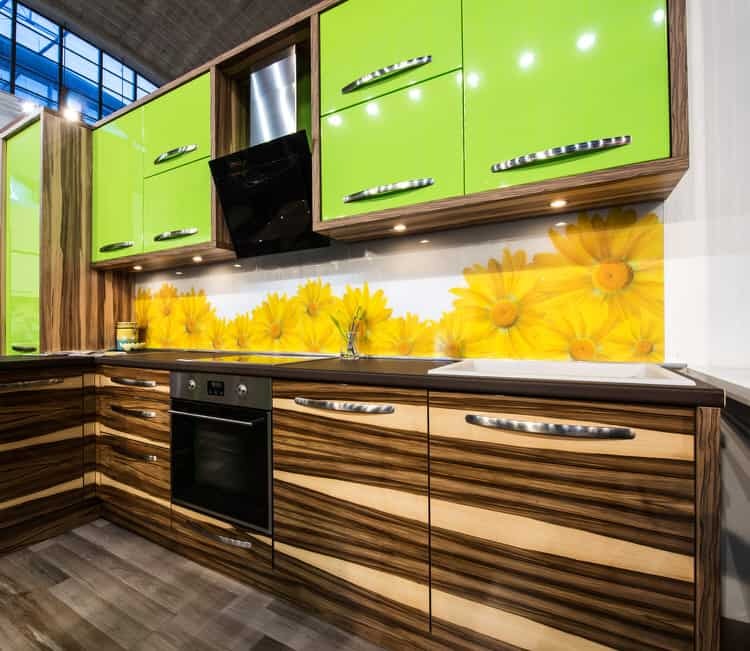 Take this one-of-a-kind finalist from the recent national kitchen and bath show. Exotic zebrawood base units create the foundation for high gloss lime green uppers. Handcrafted cabinet pulls on both create a cohesive look. A custom decal backsplash is the final, funky element in this eclectic design. 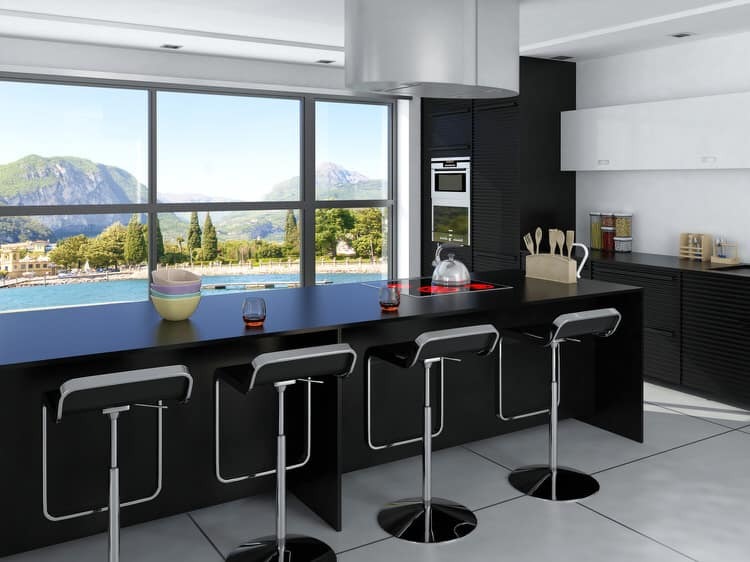 Black is the new white in contemporary design and looks fantastic in this seamless kitchen. Flush-mounted cabinet doors literally disappear into the wall while managing to incorporate lots of storage and function in the space. 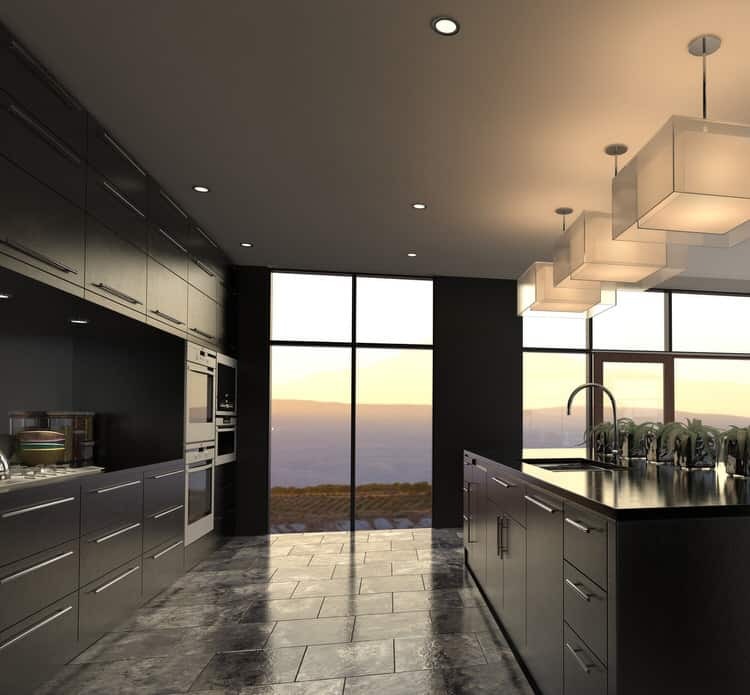 The ebony color and muted pendant lighting creates a sophisticated kitchen with cabinets and views that seem to go on forever. Modern meets sustainable in this unique kitchen design. Gone is the traditional work triangle. The entire kitchen is neatly lined up along the back wall of this studio apartment to allow more room for living space and sleeping quarters. 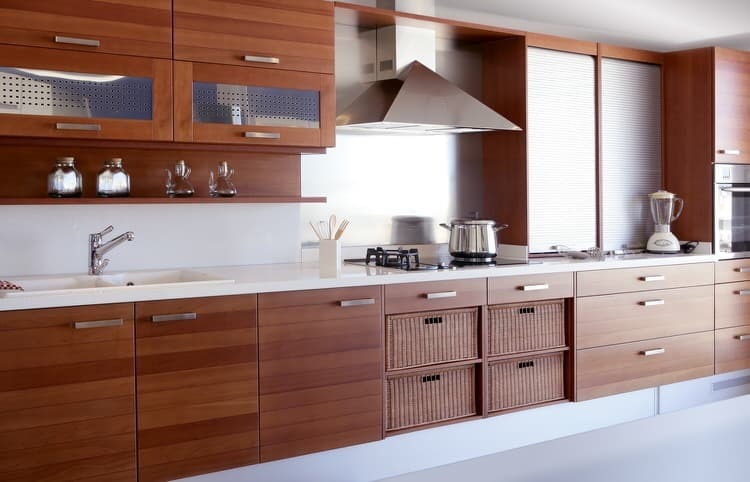 The teak cabinetry is certified by the Forest Stewardship Council as a wood product considered to be eco-friendly and socially responsible. 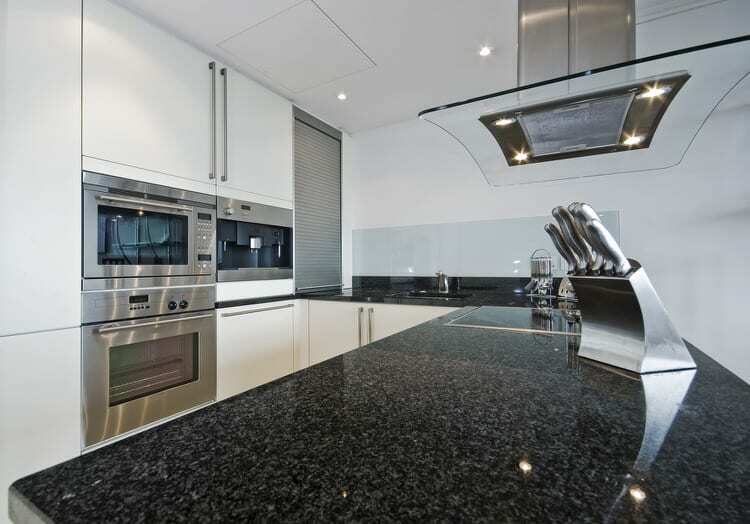 Black galaxy granite, stainless steel appliances and accents give this kitchen a very futuristic feel. 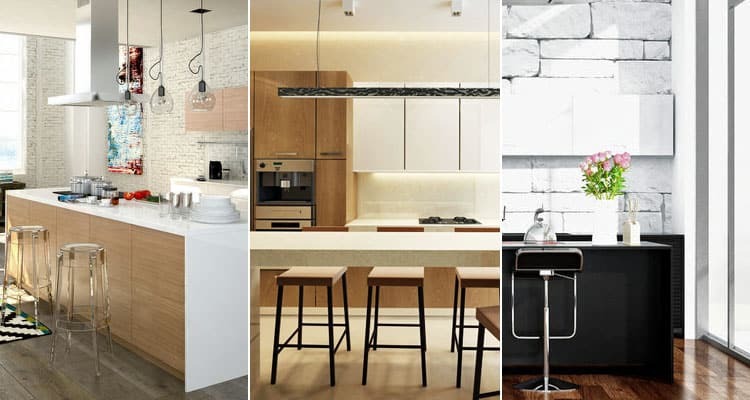 While materials and colors play a major role in giving a kitchen a modern presence, minimal color and linear design have just as much influence. 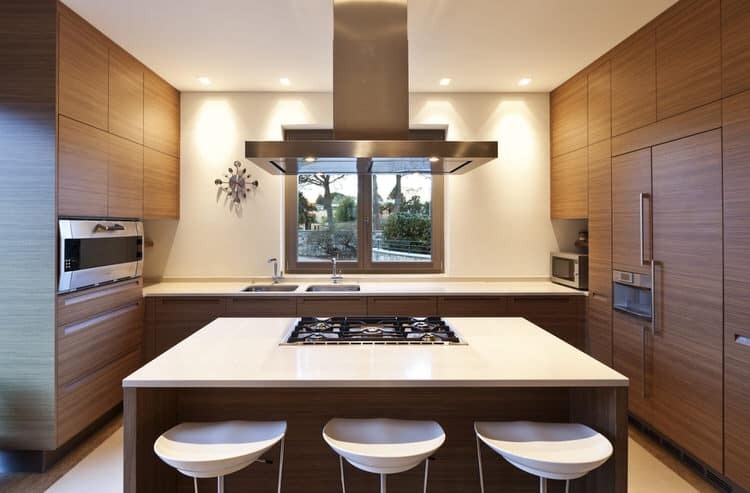 Large cabinets, the expansive island and an impressive glass and stainless hood vent also contribute to the effect. 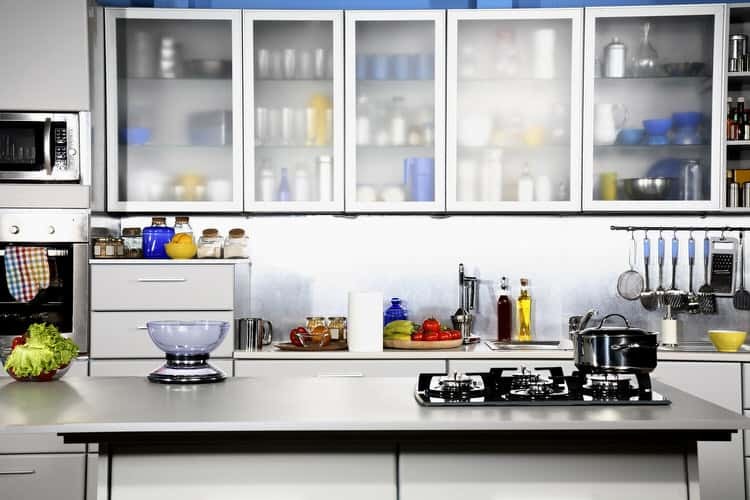 Open and uncluttered are the mantras for today’s modern kitchen. Feel free to use some of the ideas from this stylishly streamlined space. A small open shelf below the upper cabinet is the perfect spot to house your favorite spices and herbs. The island features a commercial-grade cooktop inset into the smooth, reflective countertop. Windows and a slider make the kitchen feel like it’s outside. Sometimes, cabinet knobs and pulls interfere with the minimal aesthetic of a contemporary kitchen. The seamless effect of this kitchen would be spoiled with hardware and in this case it’s really not necessary. All of the cabinets and drawers pop open with a gentle nudge. Do you think you could exist without upper cabinets? Consider this modern kitchen in Barcelona. 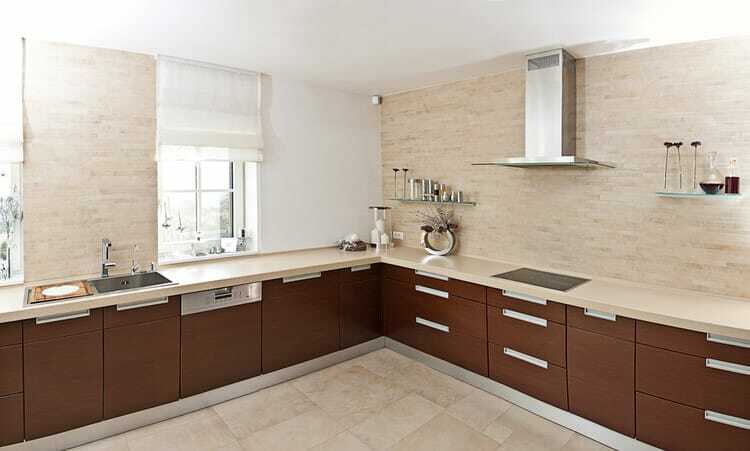 The owners wanted nothing to interfere with the natural stone mosaic wall tiles. 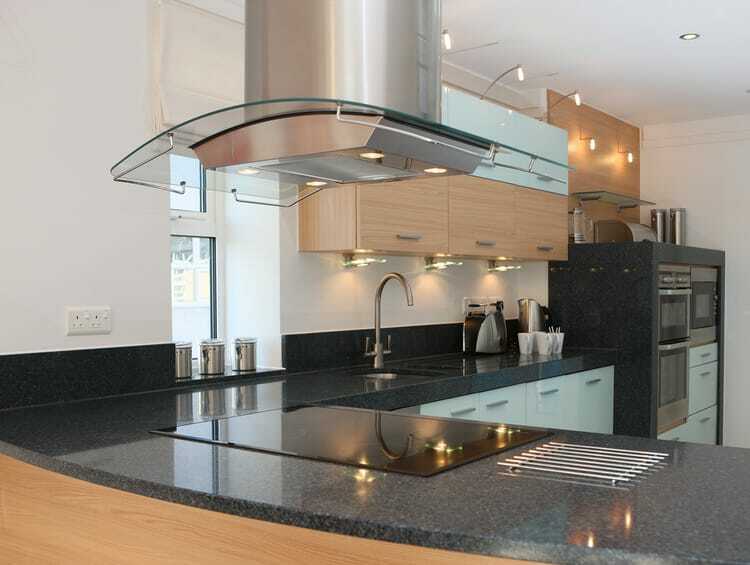 They did acquiesce and allow for the installation of two stainless and glass wall shelves that flank the cooktop. However, the rest of the storage is relegated to floor cabinets. They love the uncluttered look. 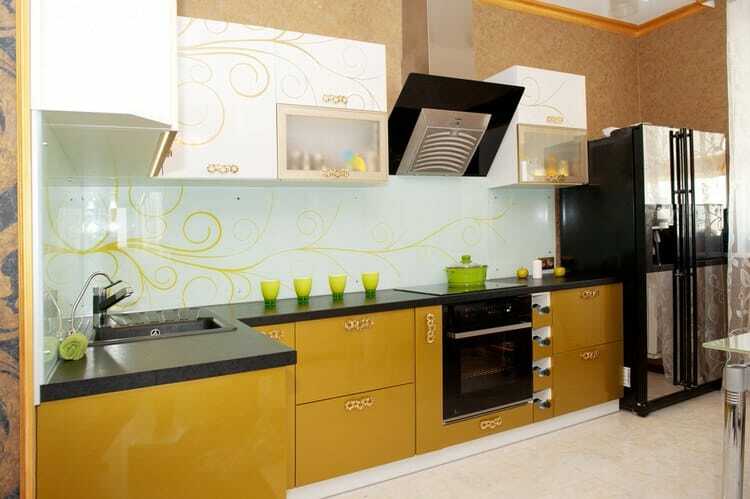 Innovative thinking and uninhibited design are the hallmarks of modern kitchens. Here we have a mélange of materials that converge to create something we’ve never seen before. Dark gray porcelain tile flooring gives way to a white lacquered and tigerwood multi-level island supported by polished chrome brackets. Two matching wood counter stools complete the seating area. A single piece concrete counter and apron sink tie in flawlessly with the lacquered cabinetry and backsplash. 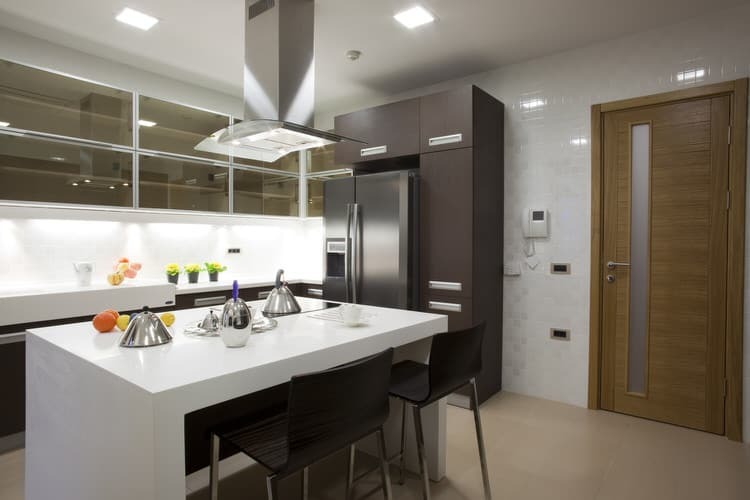 Design elements should not compete with each other in a contemporary kitchen. In this drop-dead space, a luminescent, white onyx waterfall island is a stunning design statement unto itself. The other elements definitely hold their own, but the island is truly the inspiration of the room. 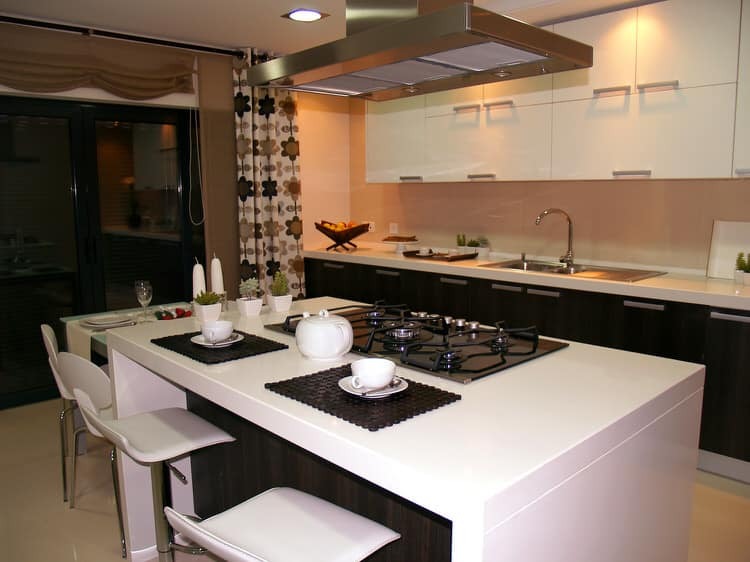 Artful strokes can bring a modern kitchen design to life. 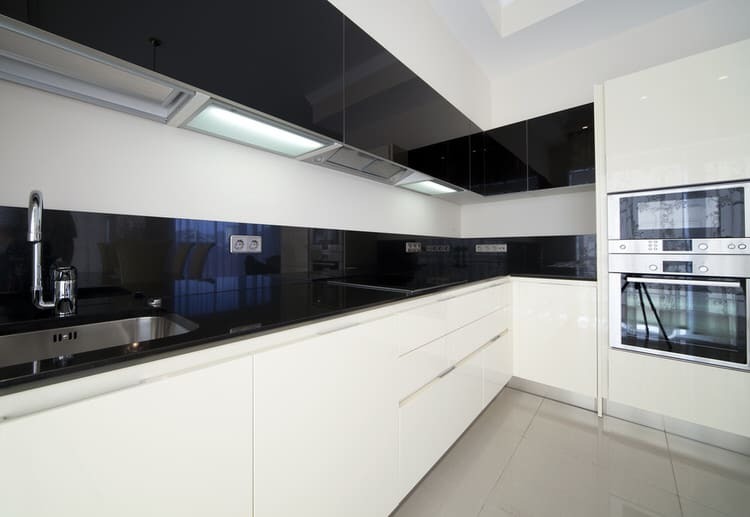 Black and stainless appliances look picture perfect with glossy amber base cabinets and black quartz countertops. The curly freeform design on the papered backsplash was copied and transferred onto the white upper cabinets to inject the kitchen with playful personality. The owner of this condo loves black-and-white stripes, but didn’t want to use them in the literal sense. He considered using a striped rug, flooring or wallpaper, but finally settled on this subtle interpretation. 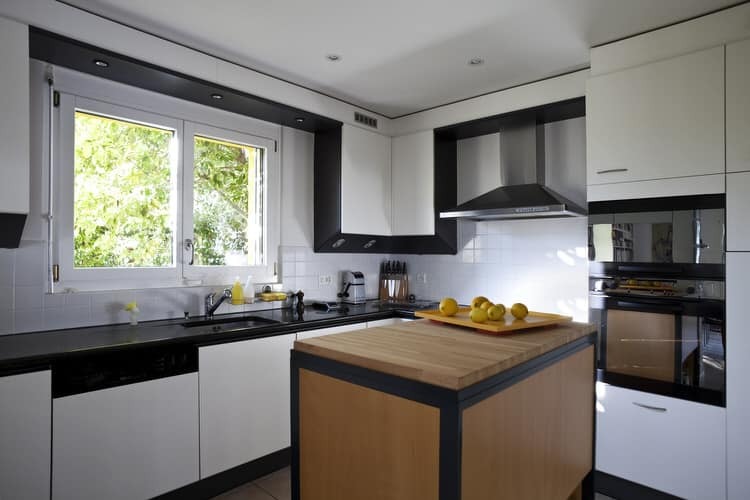 He applied two horizontal bands of black granite against the existing white walls and cabinets. Expect the unexpected in contemporary kitchens. This one is a perfect example of bringing in elements you wouldn’t normally expect to see. 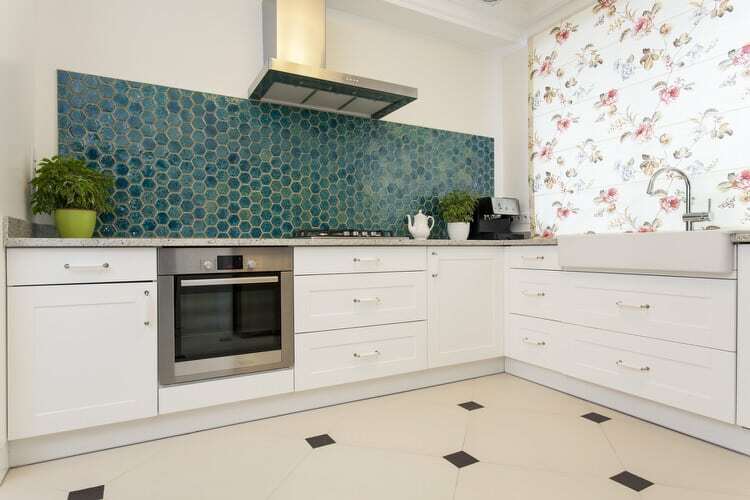 The turquoise octagonal tile backsplash is quite unusual on its own. Add the delicate floral wallpaper and the traditional tile flooring and you’ve got the makings of a truly imaginative design. A combination of white and dark wood seems fresh and inviting. 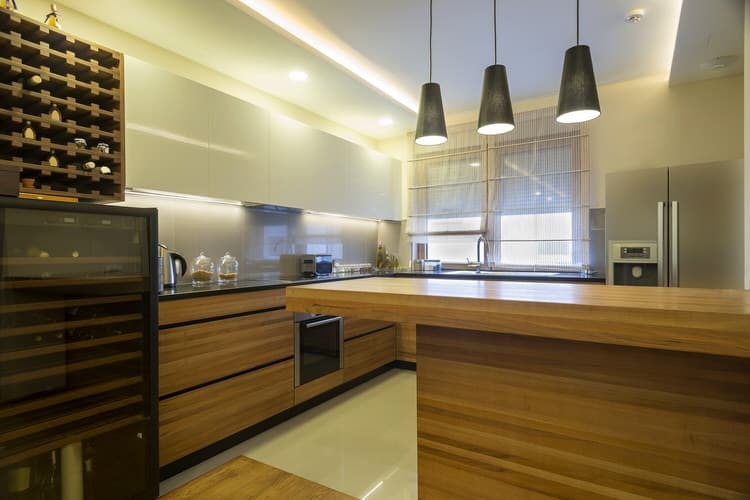 This modern kitchen reads warm and welcoming thanks to the addition of a variety of wood tones. The sleek space is balanced and tailor-made for entertaining. The deconstructed parson’s table is a real statement piece along with the white cutout chairs. 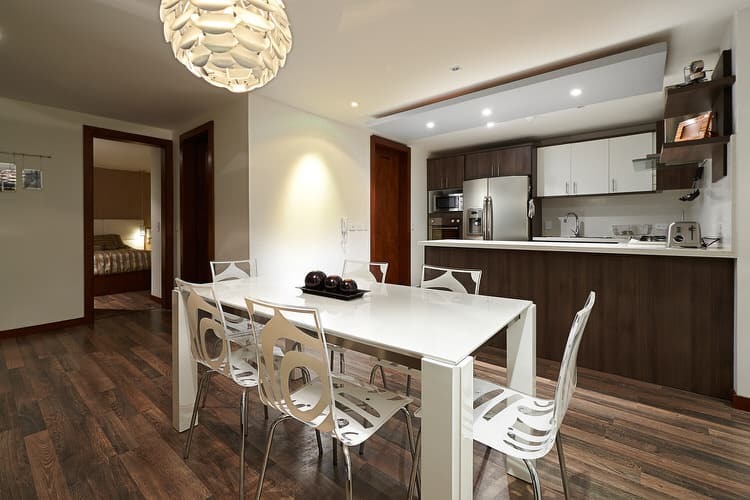 The variegated wood flooring and chocolate cabinetry beckon you come in and stay a while. 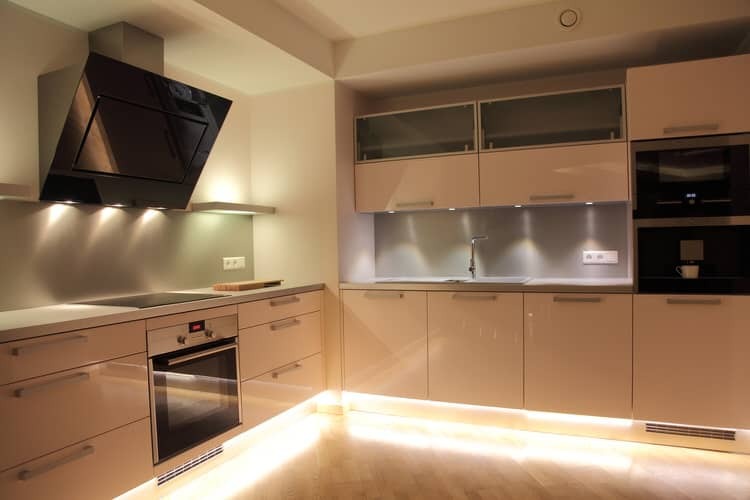 This monochromatic kitchen gets all of its appeal from the use of innovative lighting. 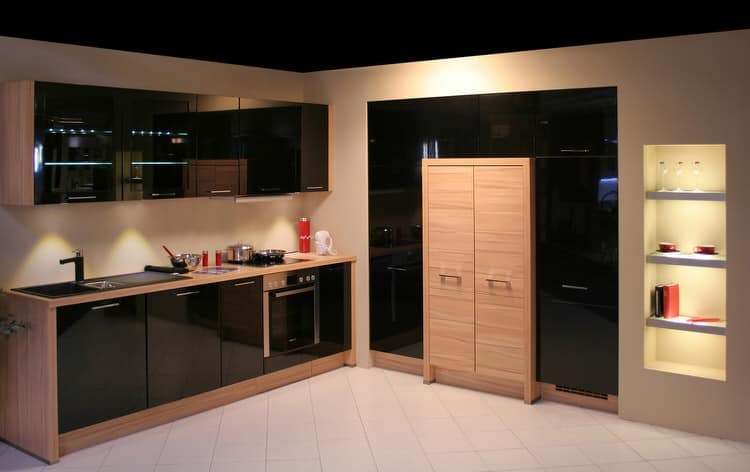 The streamlined modern cabinetry and European appliance package are definite conversation starters. However, the toe kick, under cabinet and vent hood lighting steal the show. Take a cue from country kitchens by using a mix of open and closed storage. Three levels of floating shelves to the right of the sink add a graphic element to this contemporary kitchen. Don’t overlook open shelves as the perfect storage solution for everyday dishes, storage containers and miscellaneous gadgetry. Create extra workspace with a modern, oversized kitchen island. 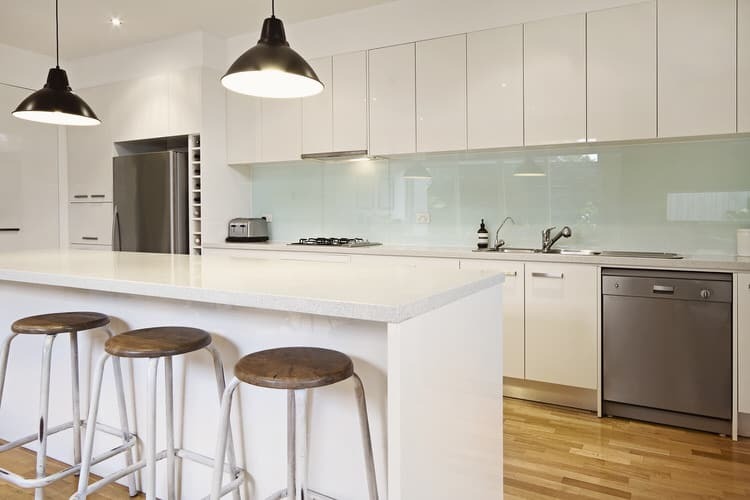 This white lacquered island is the gathering spot for the family with adult counter seating and a lower table extension to seat the little ones. The recently added island features a gas rangetop and coordinates perfectly with the existing chocolate and white cabinetry. This tiny modern kitchen has a mix of old and new elements that looks totally on trend. The vintage melamine cabinets and hardware remain from the old design. 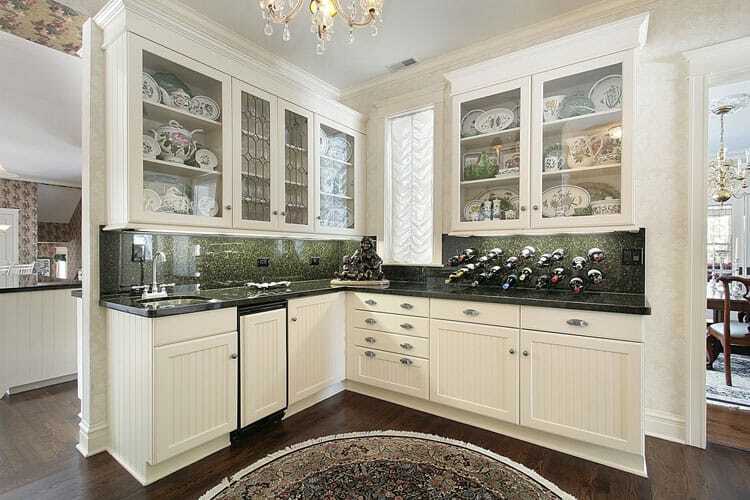 The homeowner added new uppers with frosted glass doors to display her collectible dinnerware. She painted the walls a bright red and installed an aqua glass panel behind the cooktop as a stylish backsplash. Primary colors take this white contemporary kitchen from ordinary to exceptional. The bones of the kitchen are fantastic. The white cabinets and island banded in black make quite an impact. All it takes are a few artfully arranged accessories in blue, yellow and red to add a sense of character and play. We love the contemporary combination of feather gray and white in this kitchen. Everything about the space is perfect. The symmetrical use of lighting above the island and glass front cabinets flanking the cooktop add to its flawless style. 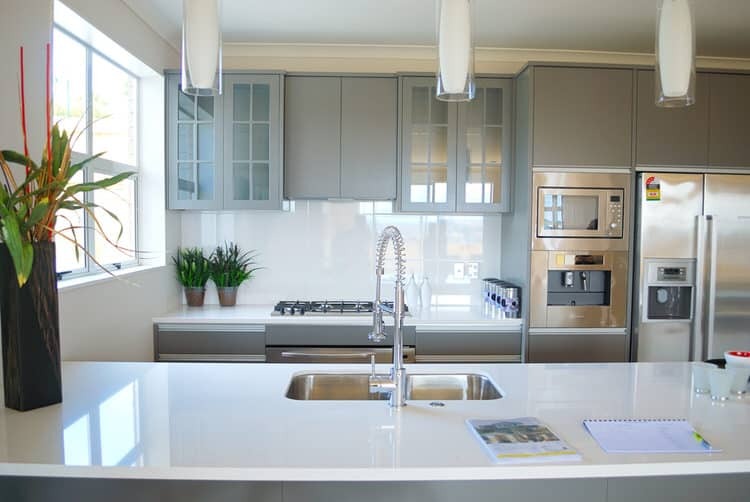 Crisp, white solid surface counters, backsplash and stainless appliances add shimmer to the space. Here something you don’t see every day. We’re talking about the enclosed unit way back in the corner that houses the ovens, microwave and storage drawers. Give up? We think it looks like a modern version of the old Hoosier cabinets that were popular in early 20th century American kitchens. Those cupboards combined storage and functionality into a single unit—they were the original kitchen multitaskers. Primary colors are a popular choice in modern kitchens. These young homeowners threw caution to the wind and decided to incorporate their favorite color into their version of modern design. 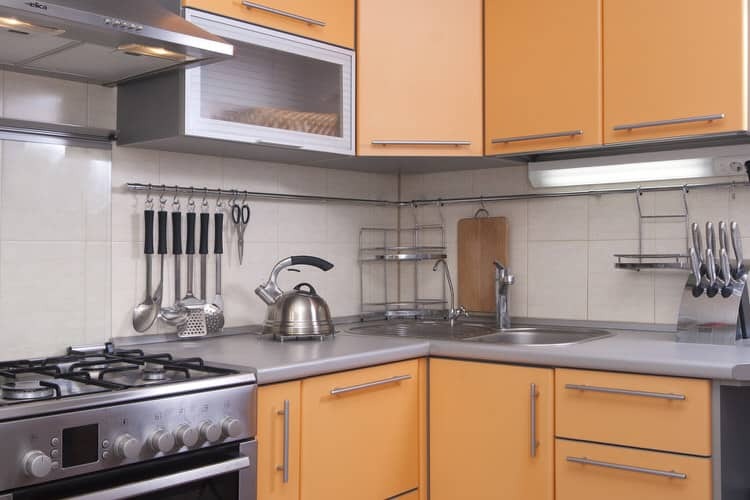 They found a manufacturer of old style metal cabinets and ordered them in a lovely shade of apricot. The kitchen has a decidedly retro-modern vibe with the addition of stainless steel countertops and appliances. 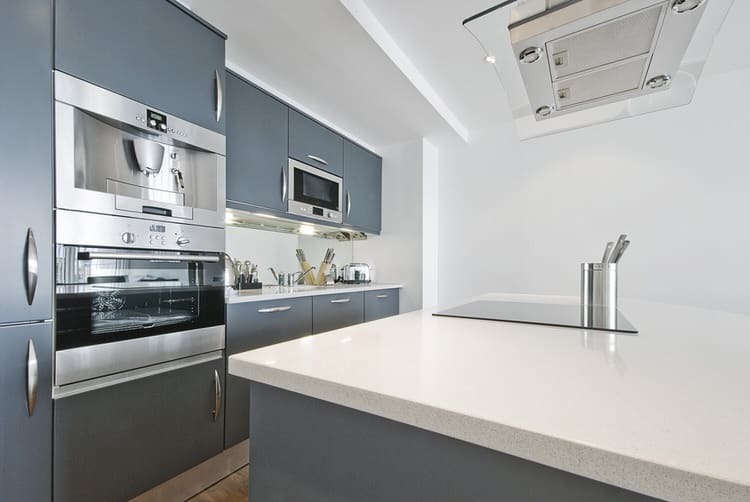 Clean, shiny and streamlined are popular adjectives when describing today’s contemporary kitchens. This kitchen in particular is a literal example of these descriptors. 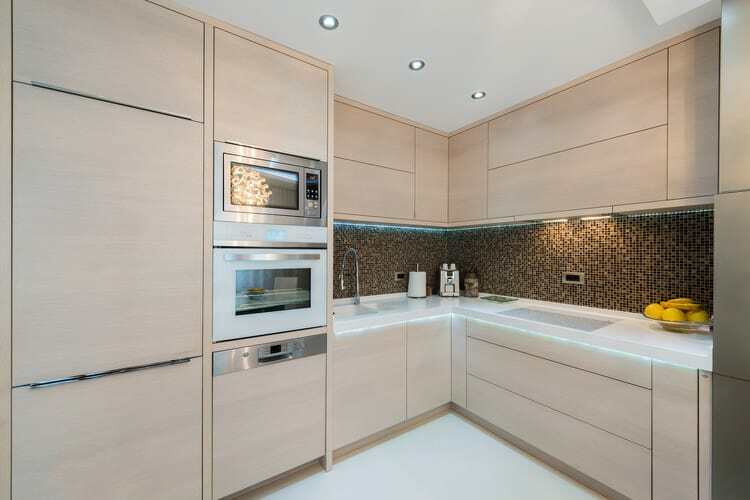 The combination of glossy and reflective surfaces emphasizes the clean lines of the cabinetry. The black-and-white checkered floor tiles add a punch of personality and visual interest to the space. 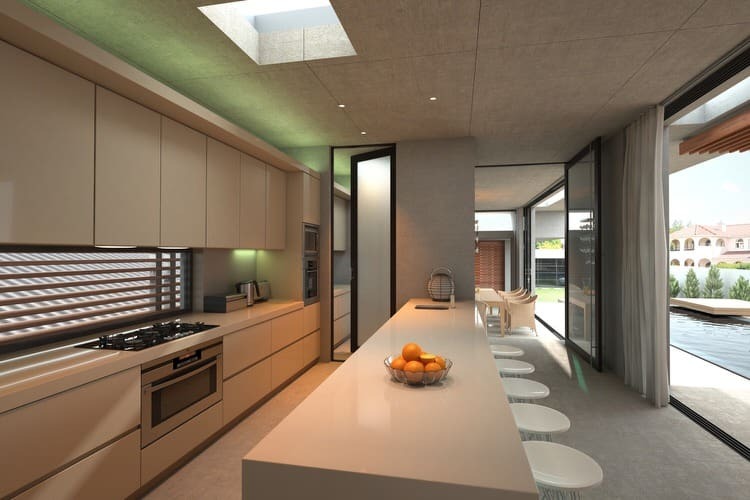 Creating an urban, modern kitchen in an unconventional space can be a challenge. This kitchen is in what was formerly a school science lab. 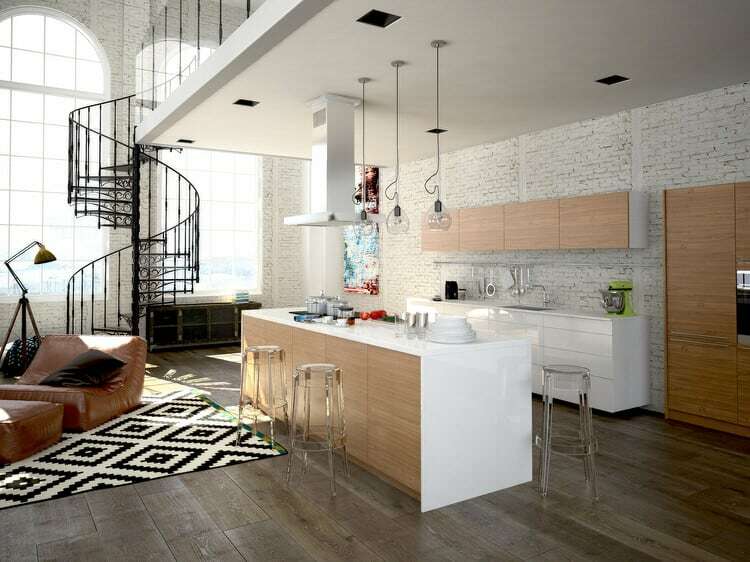 The entire building has been renovated and converted into one- and two-bedroom condos. The designer used the original wall counter as the main work surface for this kitchen and the lab table as the kitchen island and seating. The existing storage unit was refinished and now houses the refrigerator. This is a modern take on a cottage kitchen. The ultra-sleek version features linear white cabinets, gleaming quartz dark stone counters and a stainless appliance package. The configuration makes cooking and entertaining effortless. Minimal light fixtures support the modern vibe and the black accents anchor the space. The faux marble effect on the kitchen walls coordinates brilliantly with both the dark cabinets and white granite countertops. The cork flooring is a great idea for the cook that spends hours on end in the kitchen. Cork is an under utilized flooring alternative. It provides natural cushioning underfoot and is a renewable resource. 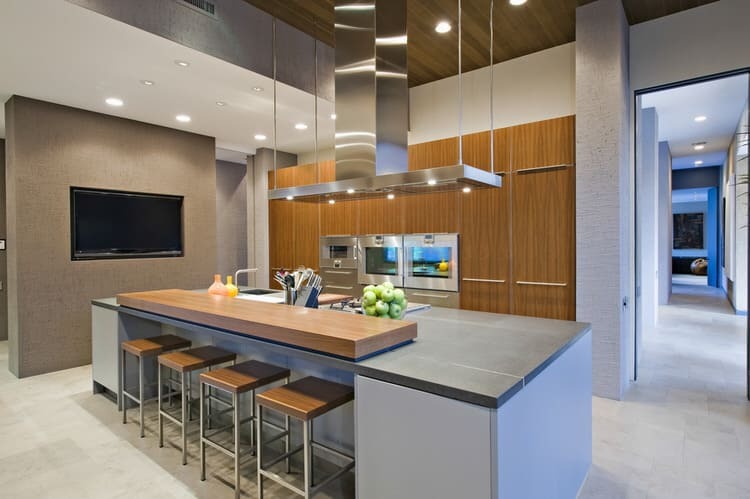 Natural wood tones make this contemporary kitchen an excellent place to cook and entertain. Guests can walk up to the counter and grab a cold beer or glass of wine from the beverage cooler. 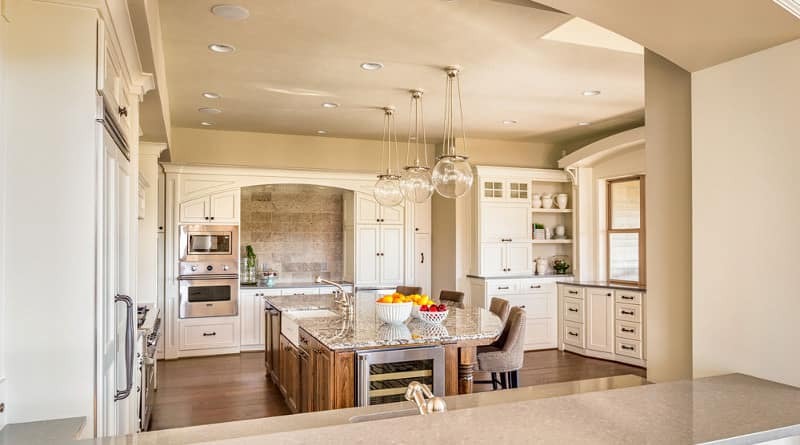 The absence of a center island give this kitchen ample space for multiple cooks. Create an eat-in space by pulling the bar stools up the the front counter. This house still had the original mid century kitchen when it was recently purchased. 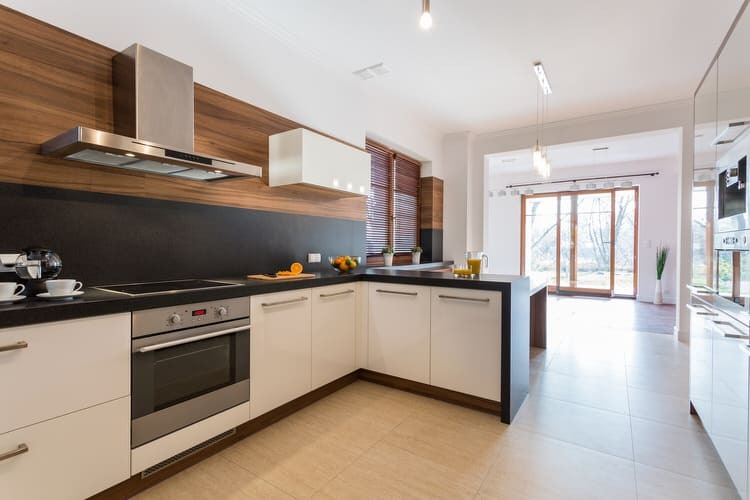 The new owners updated the appliances and replaced the dry and cracked laminate countertops with black quartz that perfectly matches the black cabinet detail. The solid wood island was sanded and restored to its former beauty. Adding a fun color to a modern kitchen takes commitment and a lot guts. Unless you have the budget to renovate every few years, you probably shouldn’t go there. 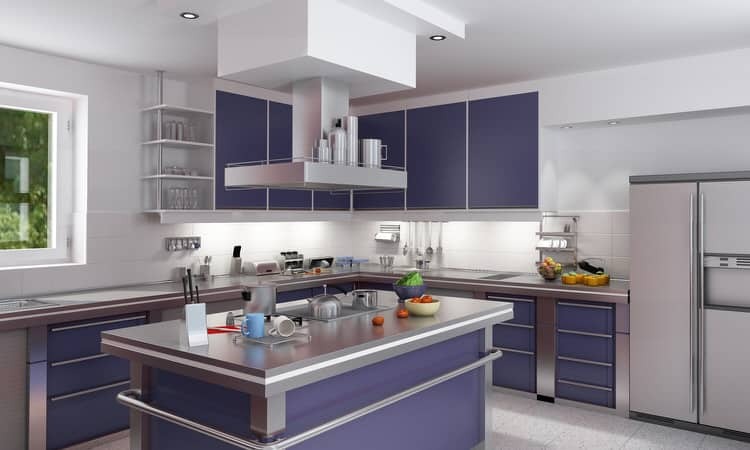 The blue in this kitchen is an integral part of the cabinetry, so it will be difficult to change. The cobalt looks striking with white and stainless steel, but it is something you’ve must commit to unconditionally. Can you find the refrigerator in this modern kitchen? Hint: it’s not the large double-door cabinet to the right of the counter. That is pantry storage. The refrigerator is actually in the corner next to the wall. 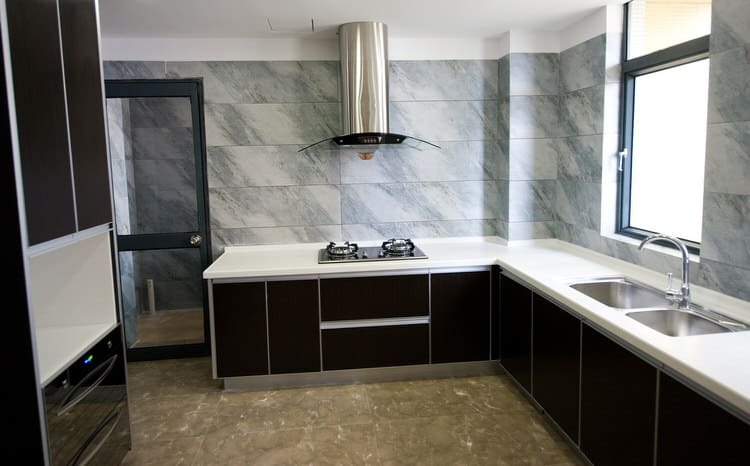 It is an undercounter model that was specifically requested by the homeowner who, by his own admission, is not much of a cook.